Bai, S., Chang, C., Han, X. and Shen, Q. (2013). Modified Single-Cell Transient Gene Expression Assay in Barley Epidermal Cells. Bio-protocol 3(9): e690. DOI: 10.21769/BioProtoc.690. Bai, S., Liu, J., Chang, C., Zhang, L., Maekawa, T., Wang, Q., Xiao, W., Liu, Y., Chai, J., Takken, F. L., Schulze-Lefert, P. and Shen, Q. H. (2012). Structure-function analysis of barley NLR immune receptor MLA10 reveals its cell compartment specific activity in cell death and disease resistance. 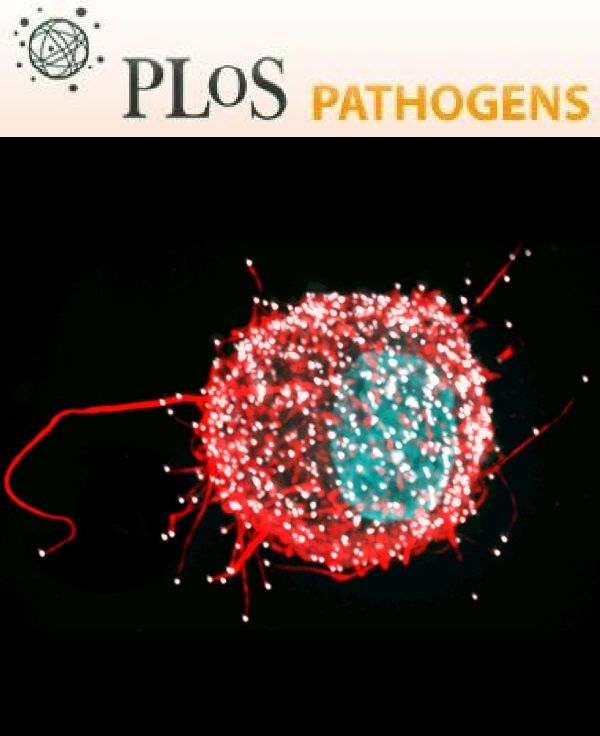 PLoS Pathog 8(6): e1002752. Transient gene expression via biolistic particle delivery is a widely used technique for gene functional analysis in plants. In this protocol we describe a modified single-cell transient expression assay through transformation with a particle inflow gun of the model PDS-1000/He system (Bio-Rad). This assay was originally optimized for analyzing cell death activity and disease resistance function of the barley MLA (mildew locus A) disease resistance proteins against the powdery mildew fungus, which can be further adopted for other purposes for other types of plant proteins and in some other plant species, including Arabidopsis thaliana. Inoculate plants with powdery mildew spores to prepare inoculum and sow barley seeds to grow plants for bombardment one week in advance. The plants were grown in a growth chamber under a 16 h/8 h, 20 °C/18 °C day/night cycle with 70% relative humidity. Prepare Benzimidazol plates one day in advance. 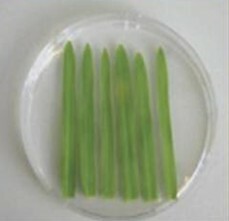 Cut primary leaves and put them on Benzimidazol plates with adaxial side up (Figure 1), 3-5 leaves per petridish (90 mm) per shot, incubate at least 4 h before shooting. Figure 1. Picture showing preparation of Benzimidazol agar plate with barley leaves for bombardment. 5-6 barley primary leaves were detached from 1 week old barley seedlings and put side by side with adaxial side up on prepared Benzimidazol agar plate. Weigh 9 mg gold particles in a 1.5 ml tube. Add 1 ml 70% ethanol, vortex 5 min, sediment particles for 15 min on bench. Spin 2 sec. (about 2,000 rpm), discard supernatant. Repeat 3 times: add 1 ml sterile H2O, vortex 2 min, sediment 1 min, spin 2 sec. (about 2,000 rpm), discard supernatant. Add 1 ml of 50% glycerol (in water), vortex (gold particles can be stored at -20 °C for 2-3 weeks). Vortex gold particle for at least 5 min. Mix equal molar plasmid and reporter DNA (e.g. GUS or GFP reporter), do not use more than 2 μg DNA in total, add ddH2O when volume is less than 5 μl. Aliquot 50 μl gold particles into each empty tube, then add DNA solution. While vortexing, add: 50 μl 2.5 M CaCl2 drop-by-drop, then 20 μl 0.1 M spermidine, vortex for 3 min in total. Sediment particles for 1 min, spin 2 sec. (2,000 rpm), discard supernatant. Add 140 μl 70% ethanol, vortex, spin 2 sec. (2,000 rpm), discard supernatant. Add140 μl 100% ethanol, vortex, spin 2 sec. (2,000 rpm), discard supernatant. Add 15 μl 100% ethanol, vortex, store on ice until used. Fix the macrocarriers in macrocarier holder, suspend particles by pipetting, and apply the particles onto the macrocarrier. Dry on the bench. Dip rupture disc (900 psi) in 100% (v/v) 2-propanol and subsequentlyplace it into rupture disk retaining cap, add few more drops of 2-propanol. 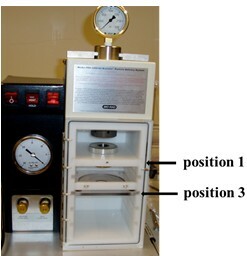 Insert macrocarrier holder with stop-screen in stop screen holder at position 1 (from top) (Figure 2). Figure 2. Picture showing the PDS-1000/He delivery system. Indicated are position 1 and 3 that reserved for macrocarrier holder and patridish holder, respectively. Insert petridish with leaves at position 3 (Figure 2). Apply vacuum up to 27 inches of mercury, trigger the shot. Arrange leaves on the petridish, put in incubator. Note: We put the leaves on the dish side by side with adaxial side up (Figure 1). Inoculate with powdery mildew condiospores at least 4 h after bombardment. 36-48 h after bombardment count GFP expressing cell numbers using fluorescence microscope. Note: The total number of cells here is the sum of compatible (haustorium, seccondary hyphae) and incompatible (only appressorium) on GUS expressing cells. We score all of the five leaves and at least 60 cells were scored. Stain leaves for GUS expression: put leaves into 15 ml falcon tube containing about 8 ml X-gluc staining solution, vacuum infiltrate 5 min for 3 times, and incubate overnight to 24 h at 37 °C. Remove GUS staining solution, add about 10 ml destaining solution, store at RT at least 2 days. Transfer leaves to large volume of ddH2O for 1 h.
Stain in coomassie solution for few seconds. Mount on microscope slide in 50% glycerol. Once on the slide the samples should be scored within few days. Score compatible (visible intracellular haustorium, and sometimes secondary hyphae on leaf surface) and incompatible (only fungal appressorium) interaction cell/site for GUS expressing cells. Note: The pH value for these plates is about 6.5. It is not necessary to adjust the pH value. 0.1 M solution, 1 g solution mix with 67.8 ddH2O, filter sterilized. Dissolve 1 volume stock solution in 2 volumes ethanol. This protocol is adapted from Shirasu et al. (1999); Shen et al. (2012) and Bai et al. (2012). Shen, Q. H., Zhou, F., Bieri, S., Haizel, T., Shirasu, K. and Schulze-Lefert, P. (2003). Recognition specificity and RAR1/SGT1 dependence in barley Mla disease resistance genes to the powdery mildew fungus. Plant Cell 15(3): 732-744. Shirasu, K., Nielsen, K., Piffanelli, P., Oliver, R., and Schulze-Lefert, P. (1999). Cell-autonomous complementation of mlo resistance using a biolistic transient expression system. Plant J 17: 293-299.